Checklists have long been used across all industries as a way to improve communication. In the case of training, checklists allow for a structured and consistent way to measure learning across organizations and departments. It’s no wonder, then, why SumTotal has developed a handy observation checklist feature. This post is here to introduce you to the SumTotal observation checklist reporting and its many useful features. An observation checklist is exactly what it sounds like: a checklist of tasks that allow you to observe your learners’ progress. In SumTotal, an observation checklist is essentially made up of a list of tasks that have been assigned to your organizations learners. The checklist features, detailed below, enable designated observers to assess an employee’s skills after the employee has completed his or her assigned training. The checklists can also be used by the learners themselves to self-assess and report on their progress. SumTotal even allows you to set checklists as a required part of your employees’ training. What are some of the features of SumTotal’s observation checklist reporting, and what do they mean for you and your organization? Observation checklists, like many of SumTotal’s valuable features, are highly customisable. You can create specific checklists for learners based on categories of skills they’re being assessed on. Checklists themselves can also be grouped according to category to be reused in different ways across your Learning Management System (LMS). The proficiency scale is a feature of SumTotal’s observation checklists that make it easier for both learners and observers to evaluate their learning progress. 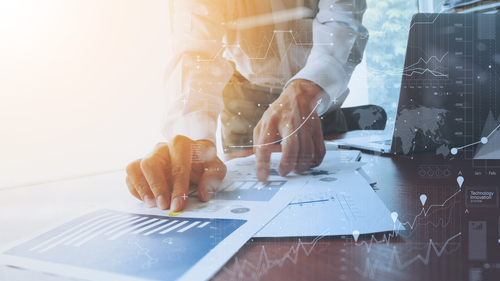 The scale is a tool that allows you to consistently assess learner skill level, ensuring that each learner’s progress is being evaluated in the same way. Each scale is made up of different proficiency values, each correlating to a set skill level. For example, you might create a proficiency scale titled “Experience level rating scale”. The scale will then need set values that define the various experience levels, such as “Beginner”, “Intermediate”, or “Expert”. Each time you create a new observation checklist you can copy an existing proficiency scale, modify an existing proficiency scale, or create an entirely new proficiency scale from scratch. Earthly can help you figure out what scale and which proficiency values will work best for you in terms of evaluating your learners’ progress. SumTotal uses the term ‘observer’ to describe a person who has been chosen within your organization to review, rate, and approve or reject checklists. An observer is essentially an individual who has permissions to observe a learner’s progress via the observation checklist, such as a manager, a subject-matter expert, or an already trained coworker. These observers review checklists, provide feedback, and make the decisions on whether the learner has passed his or her requirements. You can choose multiple ‘qualified’ observers as well as a single ‘responsible’ observer to assess each learner’s observation checklist. 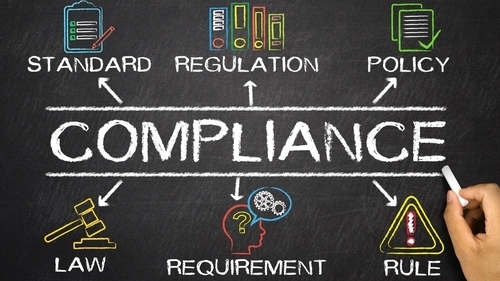 Multiple qualified observers can be given permissions to review tasks and self-assessments, provide feedback, evaluate proficiency ratings, and approve or reject a completed checklist. In order to ensure checklists are evaluated quickly and efficiently, you can also nominate one responsible observer per checklist. This person has the same permissions as a qualified observer, but with the additional understanding that he or she is specifically responsible for ensuring checklists are being approved or rejected. This feature allows you to speed up learning within your organization and always stay on track of your learners’ progress. SumTotal’s observation checklists can also be setup to allow for self-assessment, meaning each learner can take the initiative to evaluate his or her own learning progress. Learners can filter checklists based on their status: pending (meaning the checklist is sitting with an observer for evaluation), completed or rejected. They can use the self-assessment to rate their own proficiency level (please see above section on proficiency scales) and add comments on their learning progress before submitting the checklist to an observer for review. This can be set up as an optional or a required part of the learner’s training. 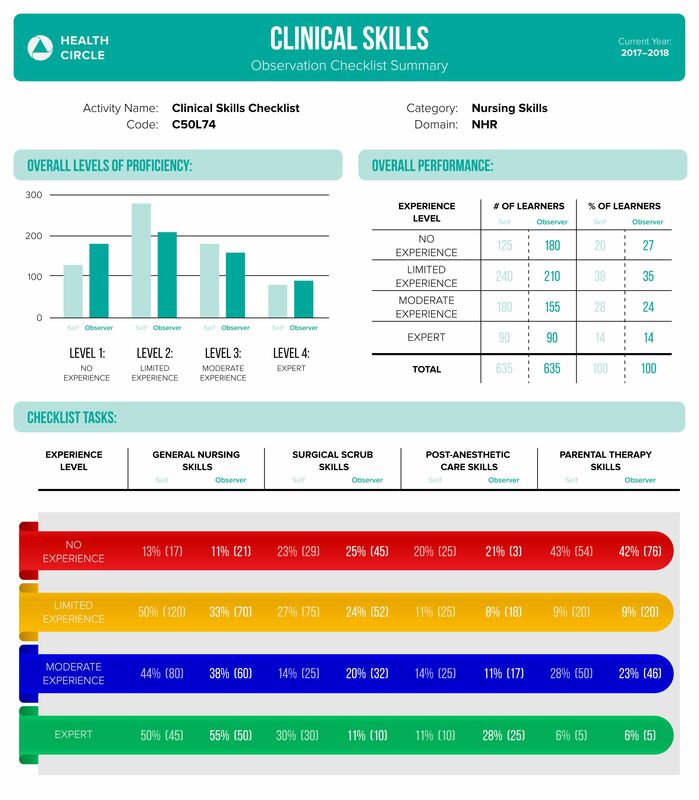 The above image shows an example of what an observation checklist report might look like under your SumTotal LMS.This particular image shows a summary report of a checklist for clinical skills testing. You can see that the checklist has specifically been created for the category of nursing skills; so, this checklist is probably one of several observation checklists within a healthcare organization. This observation checklist also uses a specific proficiency scale. In this case, the proficiency scale is based on the learner’s experience level, with proficiency values set as “No experience”, “Limited experience”, “Moderate experience”, and “Expert”. This image shows the observation checklist report from the point of view of an observer; however, we can also see that it has enabled the self-assessment feature. The observer can use the report to evaluate learner progress as a group: it allows them to see the progress of all the learners he or she is responsible for. This specific example shows how self-assessments compare to observer assessments. For example, the table titled “Overall Performance” shows that while 180 or 28% of learners performed a self-assessment claiming to have moderate experience, only 155 or 24% of learners were found to have moderate experience by the observer. in a colourful graphic showing both the frequencies and percentages of self-assessed and observer-assessed experience levels, broken down by type of skills. With Earthly’s help, you can figure out exactly what information your observers and learners need to make the best use of SumTotal’s observation checklist reporting features.